Where can I find what auctions are coming up? Please follow these links to find the auctions you are interested in: Motor Vehicle Auctions, Salvage Auctions, Trucks, Machinery & Earthmoving Auctions, Commercial, IT & General Goods Auctions. Your major city newspapers have our most current auctions as well as some up and coming sales. Where can I find what items are in the auction? There are a number of ways to see what is for sale. 1. Go to the auction timetable that is relevant to you: Motor Vehicle Auctions, Salvage Auctions, Trucks, Machinery & Earthmoving Auctions, Commercial, IT & General Goods Auctions to find details of what is for sale. Some auctions will have a catalogue that you can print out and bring with you on the day. 2. Contact your local Pickles branch and they can assist you. 3. Search this website using the relevant product search: Motor Vehicle, Salvage, Trucks, Machinery & Earthmoving, Commercial, IT & General Goods. 4. Create a Product Alert and receive a notification as soon as items become available that match your search criteria. Simply create a search and click the ‘Create Alert’ button at the top of the search results. The terms of selling your car depend on your location. See our information page about selling your car. Can I trade in my vehicle? Yes. Our trade-in service is simple, hassle-free and makes you the winner. Pickles is proud to offer this innovative auction Trade-In service. How can I get goods valued? Your goods can be valued differently according to what and how much you have to sell. Our expert valuers can come out to see your goods or you can bring them to us. Contact us and we will be able to advise you on the best way to proceed. At each auction, a deposit percentage or amount is set. As an indication a $1,000.00 deposit is required for general car sales, $1,000.00 for prestige car sales and 10% for computers. Most Salvage, Truck, Machinery or Earthmoving Plant Equipment auctions also require a deposit of $1,000.00. Make sure that you are aware of the amount of money you will need before bidding at an auction. The deposit secures the item that you have successfully bid on. Deposits must be paid for by cash or bank cheque. EFTPOS is also available. This is an administrative fee charged to the buyer at the completion of sale. This varies from auction to auction. Please refer to the specific auction catalogue at the sale you are attending to find out the relevant processing fee. Do I have to pay GST if I export my purchase overseas? Please advise us at the time of purchase that you intend to export your purchase and we will ask you to complete an Export Declaration Form. You will be required to pay the GST on the purchase price in full at the time of purchase, as the goods are not GST exempt until they have been exported. We will refund you the GST upon receipt of the above documentary evidence. Late notification of intention to export or notice that the export has occurred will result in a delay in the refund being issued. There is an Export Administration Fee that applies which will be added to your invoice and must be paid prior to completing your purchase. If you notify us of your intention to export and then change your mind we will refund you the Export Administration Fee either in full or half depending on how far through the administration cycle it has progressed. Please see Administration Fees. What is a reserve price and how is it set? Pickles provide the vendor (asset owner) with an indication of what the asset should reach at auction, however the final ‘Reserve’ price is set by the vendor. Referred is when the highest bid did not reach the reserve price and so it is referred to the vendor who will decide whether they wish to accept or decline the highest bid, or make a counter offer. This is where the highest bid did not reach the reserve price. In this situation, the asset is held back and may be placed in another auction at a later time or, the vendor may decide to remove the asset from auction. When is an item ‘sold’? In this situation the highest bid has reached or exceeded the reserve price and the highest bidder at ‘hammer fall’ has won the asset. *Please note: If you are the highest bidder and reserve has been met or passed, you have legally entered a contract at that stage, and are responsible for the purchase of the item. Failure to proceed with the transaction could see you being banned from participating in any auction at Pickles for 12 months. What is the auction process when an item is unreserved? In a specified ‘Unreserved’ auction, one of two things will happen. SOLD: in this situation the highest bid at ‘hammer fall’ has won the asset. PASSED IN: this is where no bids were received. In this situation the asset is held back and may be placed in another auction at a later time or, the vendor may decide to remove the asset from auction. N.B. An asset may appear in multiple auctions, if not sold previously. What is the auction process when an item has a reserve? In a typical auction, one of three things will happen. SOLD: in this situation the highest bid has reached or exceeded the reserve price and the highest bidder at ‘hammer fall’ has won the asset. *Please note: If you are the highest bidder and reserve has been met or passed, you have legally entered a contract at that stage, and are responsible for the purchase of the item. Failure to proceed with the transaction could see you being banned from participating in any auction at Pickles for 12 months. PASSED IN: this is where the highest bid did not reach the reserve price. In this situation, the asset is held back and may be placed in another auction at a later time or, the vendor may decide to remove the asset from auction. REFERRED: in this situation, the highest bid may have come close to - but did not reach - the reserve price. When this happens, the highest bid is referred to the vendor, who will then decide to either accept or decline the highest bid, or make a counter offer. If no agreement is reached between the highest bidder and the vendor, the vendor may decide to place the asset into another auction at a later date or remove the asset from auction. *Please note: If you are the highest bidder and your bid has been referred, you have not legally entered a contract at that stage. Therefore, if there are other items you may be interested in (in the same auction or elsewhere), you can bid on those and you are under no obligation to accept the vendor’s negotiated offer. My Pickles is your very own, free, private web space where you can register to bid in our Pickles Live online auctions, create product alerts, sign-up for regular auction alerts and brochures, and manage your profile. Registration is quick and easy – just submit your name and a valid e-mail address. Pickles Live allows you to bid online, in real-time, against our traditional physical auctions. From the comfort of your PC you can hear the auctioneer’s call, see photos of the item which is up for auction and place bids. See the Pickles Live FAQ's for more information. Pickles Online auctions are online-only auctions which run over several days. You can indicate your maximum bid and the system will bid on your behalf up to – but not over – your maximum. For more information please see the Pickles Online FAQ's. E-Salvage auctions are also online-only auctions, specialising in salvage insurance vehicles which are located in rural and remote regions throughout Australia. For more information please see the Pickles E-Salvage FAQ's. We can search for items on your behalf, and alert you when new items arrive that match your criteria. This is called a Saved Search. We will continue to alert you for 4 weeks after you create your alert. You can cancel alerts at any time, and review the alerts you have created from within My Pickles. Create a Saved Search and receive a notification as soon as items become available that match your search criteria. Simply create a search and click the ‘Saved Search’ button at the top of the search filters. Why are auction listing and product detail pages displaying weirdly? If you are experiencing any problems when trying to view pages on the new website, please follow the below steps to resolve it. Our IT team is currently working hard to resolve any problems. Missing pictures and layout problem on the Product Search page Clear your browser’s cache. Product Details page appears as a blank page – only showing the header and footer Clear your browser’s cache. How do I subscribe to be alerted about upcoming auctions? We can email you whenever there is an auction coming up that you may be interested in, in any or all states in Australia. This is called a Subscription. Firstly you will need to join MyPickles. This is a simple case of entering your email and password as requested under “Sign Up” on the top right of the homepage. You can then log in, and your username will appear next to the heart & magnifying glass icons at the top right of the page. In the drop down menu, choose “Subscriptions”. You will then receive email updates with the relevant auction information. We will continue to alert you until you change your preferences. You can cancel subscriptions at any time, and review the subscriptions you have created from within My Pickles. PicklesLIVE is a powerful online auction service that lets anyone join a physical auction in real time over the internet. If you are unable to attend an Auction in person, our innovative online bidding system PicklesLIVE allows you to participate online in our live physical auctions from the comfort of your home or office anywhere in Australia. Hear the auctioneer’s voice, see images of the vehicles and participate in all the bidding action with a click of a button. How do I register for My Pickles? My Pickles is a free, private web space where you can register to bid for PicklesLIVE auctions, create product alerts, sign-up for regular auction alerts and brochures and manage your profile. All you have to do is provide a valid e-mail address to access to My Pickles - it only takes a few minutes to sign up. Click on the 'My Pickles' link in the left menu or Sign up now. To bid via PicklesLIVE, your computer must meet the following System Requirements. At each auction, a deposit percentage or amount is set. The deposit amount is dependant on the type of auction - please contact us for more information. Make sure that you are aware of the amount of money you will need before bidding at an auction. The deposit secures the item that you have successfully bid on. Deposits must be paid for by cash, bank cheque or EFTPOS. Why was I charged a $1 pre-authorisation fee? When a credit or debit card is added to a My Pickles account the card details are validated by the bank charging the card with a $1 pre-authorisation. This amount never eventuates into an actual charge on the cardholders' account - it will disappear within 5-7 days. Any time the credit card details are changed or updated on the My Pickles account this pre-authorisation will occur again. Why can't I access PicklesLIVE from my place of employment? When using a company network to participate in a PicklesLIVE auction the firewall needs to be configured to permit outbound connections. The system requires TCP port 1935 to be open on network firewalls to enable the use of Flash Player audio, and ports 443 and 80 to be open to enable http and https access. To enable audio/video streaming, the following IP addresses may need to be whitelisted - please contact your network administrator for assistance. If your company policies do not allow you to download and install Flash Player, sound will not be enabled within PicklesLIVE. Please contact your IT department for assistance. If you are using Internet Explorer and letters are displaying instead of icons in the Item Details section, it is likely that certain fonts are being blocked. These fonts are served from the website https://au.velocicast.io/icon_font/fonts/. The following files may be blocked by your network - please contact your network administrator for assistance. Your computer must have a sound card installed (see the minimum requirements page). Do not forget to check that your speakers are plugged in and turned on. When using the PickleLIVE app for the first time, make sure you download Adobe Flash Player to enable the sound by clicking on the red Flash Player icon located on the item image. Follow the instructions to download and install. Why is the bidding page stuck on the first lot? The auction has not started yet. Once it is started you will be able to hear sound streaming through and the pictures of the car will change. Click the Refresh option on the bidding page if you believe the screen has frozen. What do I do if I get to the bidding page but I don't see anything? Make sure that your computer system meets the minimum requirements. What fees are involved in purchasing an item via PicklesLIVE? You should be aware that appropriate processing and internet bidding fees will be added to your item purchase price. Click here to view the fees. What do I do if PicklesLIVE is experiencing technical difficulties? If the incident occurs in the first 20 minutes of the auction and the problem has not been resolved, the auction will be delayed for a further 10 minutes. Pickles will announce for participants to fax or email the lots they are interested in bidding on. We will then contact you via phone so you can still bid live on the lots. If the issues have not been resolved the auction will recommence without PicklesLIVE. PicklesLIVE will recommence as or when the problem has been resolved. Throughout this process the Auction Clerk/Auctioneer will continue to inform you of developments. If you have further enquiries, please contact our Service Desk on 1800 005 336 or email support@pickles.com.au. Having trouble using PicklesLIVE bidding application with your browser? The PicklesLIVE application works on all recent versions of modern browsers. If you are using an old browser version or are using a mobile device, you may prefer to use the PicklesLIVE mobile app. What is the PicklesLIVE Mobile App? The PicklesLIVE Mobile App is a mobile version of the Pickles Live online technology. What can I use the PicklesLIVE App for? The PicklesLIVE App enables you to search, watch, bid, buy and sell from anywhere in Australia, in real time on your iPhone, iPad or Android device. Where do I access the PicklesLIVE App? You can login to the app with your existing My Pickles username and password from the home screen of the App after download. If you do not currently have login details, please go to www.pickles.com.au and create a My Pickles account. Please note: If you are a Permanent Buyer and do not have a login, you will need to contact the Pickles Permanent Buyer Officer for a specialised My Pickles login. Which devices can I use the App on? The PicklesLIVE App is available on iPhone, iPad or Android devices. Are there any additional requirements for me to use the App? The PicklesLIVE App is available via home/corporate wi-fi or wireless internet. If you are using wi-fi, the system requires TCP port 1935 to be open on network firewalls to enable the use of flash audio, and ports 443 and 80 to be open to enable http and https access. When using the PickleLIVE app for the first time, to enable sound, make sure you get Adobe Flash Player by clicking on the red icon over the asset images. For more information view the System Requirements. What is the Watch list feature? The Watch List feature can be used to shortlist the items you are interested in. Simply go to the item listing, slide left and tap on the Watch icon to save items. You can filter the item listing to view all of your short listed items in one place. How will I know when my Watch List items are about to go to auction? Go to Settings and make sure that your notifications for Upcoming Watch are switched on and configured. You can decide whether you want to be notified from 1 up to 5 items in advance. You will receive a push notification on your mobile device when your items are upcoming. How do I access the Live Auctions to Buy? Please contact Pickles Service Desk on 1800 005 336. PicklesONLINE is our exciting new online-only auction system. Auctions run over a period of several days and at any time you may indicate your maximum bid amount. The PicklesONLINE system will then bid on your behalf up to your maximum, but not beyond it. This frees you up so that you don’t have to keep watching the progress of an auction. To participate in PicklesONLINE you will need to open a My Pickles account. Next, simply sign-in and locate the PicklesONLINE item you are interested in. All bidding takes place on the Pickles website – there are no additional software downloads required. When you are ready, enter your maximum bid. You will be asked to provide registration details the first time you bid in a sale. If you are successful in your final bid a deposit will be deducted from your credit card. Buy Now – in addition to being offered through online auction, some lots may be offered for immediate purchase. We call this Pickles Online Buy Now. Take the stress out of bidding – accept the Buy Now price, pay your deposit online and the item is yours today! You don’t even have to wait for the auction to end. Normal charges apply. Permanent Buyers do not need to register or pre-authorise a deposit to participate in Pickles Online. Note - deposits apply only to vehicles (e.g. cars, trucks, etc) and not other items. Where are PicklesONLINE Items Located? PicklesONLINE items may be located at any Pickles branch throughout Australia. Therefore please check each item’s location prior to bidding or choosing to Buy Now. The item’s location is listed at the bottom of the item details screen. (This is the same screen where you place your bid or click the Buy Now button). PicklesONLINE – Drive Auction vehicles may be located anywhere throughout Australia. Therefore please check each item’s location prior to bidding. The vehicles location is listed in the vehicle description details. (This is the same screen where you view the description of the vehicle). Buy Now allows you to purchase an item immediately, online, without having to wait for the auction to end. Items being offered for immediate purchase will always display a Buy Now price. To purchase an item immediately using Buy Now you will first need to open a My Pickles account. After this, find the item you are interested in, and sign in. 1. Click the Buy Now button next to the Buy Now price. 2. In the next screen, confirm the purchase amount. 3. You will be asked to confirm your buyer details if you have not already registered in this sale (Permanent buyers skip this step). 5. You will be asked to pre-authorise a deposit if you have not already done so (Permanent buyers skip this step). Note: You need to enter your buyer registration details the first time you bid or Buy Now in each auction. Note: You need to pre-authorise one deposit for each item you might win. Take the stress out of bidding – accept the Buy Now price, pay your deposit online and the item is yours today! You don’t even have to wait for the auction to end. Normal charges apply. What is the difference between PicklesLIVE and PicklesONLINE? PicklesLIVE allows you to participate in our traditional auctions from the comfort of your own PC. You will hear the auctioneer’s call, see photos of the item being auctioned and be able to place bids at the click of a button. To participate in Pickles Live you will need to open a My Pickles account, register for the sale you are interested in, pre-authorise a deposit and download our PicklesLIVE software. When the auction starts, sign in and use the software to bid or to observe the auction. PicklesONLINE auctions are online-only and run over a period of several days. The PicklesONLINE system can bid on your behalf up to a maximum amount that you specify – so you don’t need to continuously watch the auction. To participate in PicklesONLINE you will need to open a My Pickles account and then place a maximum bid on the item you are interested in. You will then be asked to confirm the bid amount, register your details and pre-authorise a deposit. Normal charges apply. All bidding occurs on the Pickles website – there are no additional software downloads. What are the different online services offered by Pickles? PicklesLIVE allows you to bid online, in real-time, against our traditional physical auctions. From the comfort of your PC you can hear the auctioneer’s call, see photos of the item which is up for auction and place bids. PicklesONLINE auctions are online-only auctions which run over several days. You can indicate your maximum bid and the system will bid on your behalf up to – but not over – your maximum. Some PicklesONLINE items are also available for immediate purchase. To secure your item without the pressure of bidding simply accept the Buy Now price, pay your deposit online and the item is yours. Normal charges apply. When a credit or debit card is added to a My Pickles account the card details are validated by the bank charging the card with a $1 pre-authorisation. This amount never eventuates into an actual charge on the cardholders account, it will disappear within 5-7 days. Any time the credit card details are changed or updated on the My Pickles account this pre-authorisation will occur again. Do I need to place a deposit to use PicklesONLINE ? An initial deposit will not be required to use PicklesONLINE. If you are successful in your final bid a deposit will be deducted from your credit card. How do I bid in a PicklesONLINE auction? To bid in a PicklesONLINE auction you will first need to open a My Pickles account. After this, find the item you are interested in, and sign in. 2. In the next screen, check your bid. 4. Click the Confirm button. Finally, you will be taken to My Pickles where you will see the results of all your Pickles Online bidding activity including the lot you just bid on. What fees and charges apply to PicklesONLINE auctions? A processing fee, which may vary from sale to sale, applies to all purchases made through PicklesONLINE. You can check the processing fee amount on the bid confirmation and on the Buy Now confirmation screens. This processing fee applies whether you win through bidding or through carrying out a Buy Now purchase. The fee is calculated on the final sale price of the item (and not on your maximum bid). If you win through bidding, then the final sale price is the current bid. If you win by choosing to Buy Now, then the final sale price is the Buy Now price. Remember, if you are bidding, then the fee shown to you on the confirmation screen is the most you should expect to pay and the actual fee will be less if the final sale price is less than your maximum bid. Can I adjust my bid if I make a mistake? Yes – if you are the current bid holder, you can adjust your maximum bid up to any value you like. You can also adjust your bid down to the current bid value. For example, if you accidentally bid $100,000 but you meant to bid only $10,000 then you will probably be winning the lot. The current bid may be an amount such as $7,000. In this case you may adjust your maximum bid down to any amount which is at least equal to $7,000. You are free to adjust your bid as many times as you like. How do I adjust my bid? You may adjust your maximum bid as often as you like. Why am I being asked to place my Maximum bid? When bidding, you are asked to enter your maximum bid. The PicklesONLINE system will bid on your behalf up to your maximum bid but not beyond it. This means that you do not have to keep returning to the website to make sure you stay ahead of other bidders – Pickles Online does this for you. The PicklesONLINE System attempts to win the auction at the lowest price possible. Therefore if your maximum bid meets the vendor's reserve price then the current bid will increase to the reserve amount so that you are winning the item. Pickles Online never bids beyond your maximum bid. It is possible for you to win the item at far less than your maximum bid amount. If another buyer indicates a higher maximum amount than yours, then you will be outbid. We will send you an email if this happens and you may return to the Pickles website to increase your maximum bid if you choose. Please note that email can be an unreliable communication method and we advise you to always log in to My Pickles to check the status of your auctions. What is the difference between the Maximum bid and the Current bid? Your maximum bid is the most you are prepared to bid for an item. When bidding, you are asked to enter your maximum bid. The PicklesONLINE system will bid on your behalf up to your maximum bid but not beyond it. This means that you do not have to keep returning to the website to make sure you stay ahead of other bidders – PicklesONLINE does this for you. Your maximum bid is not revealed to any other buyers. Only you and the PicklesONLINE system know the value of your maximum bid. The current bid is the amount at which the item will sell if no further bidding occurs, no-one buys the item using Buy Now and if the vendor’s reserve price is met. All buyers can see an item’s current bid. The minimum bid a buyer may place on an item is the current bid plus a bid increment. The amount of the increment depends on the current bid. If there is no current bid on an item then the minimum bid (or starting bid) is set by Pickles. The PicklesONLINE system attempts to win the auction for you at the lowest possible price. Therefore if your maximum bid meets the vendor's reserve price then the current bid will increase to the reserve amount so that you are winning the item. Pickles Online never bids beyond your maximum bid. Each bid placed in a PicklesONLINE auction must exceed an item’s current bid by the “Bid Increment". The bid increment amount depends on the item’s current bid. For example, if the current bid on an item is $50 then the bid increment is $1 and the next bid must be at least $51 ($50 + $1). If the current bid is $750 then the bid increment is $10 and the next bid must be at least $760 ($750 + $10). If the current bid is $18,800 then the bid increment is $50 and the next bid must be at least $18,850 ($18,800 + $50). Remember – when you place a bid you are indicating the maximum you are prepared to pay. The system will bid on your behalf up to your maximum, but not beyond it. Therefore the current bid on an item may be less than the maximum indicated by the bidder. Only the bidder knows their maximum. New bids must exceed the current bid by at least the bid increment. The minimum valid bid is always shown on the bidding form for each item. Also – the current bid holder can adjust their maximum bid at any time, as long as their new maximum is at least equal to the current bid. How is a bid increment calculated? The bid increment amount depends on the current bid on an item. Some items have a reserve. If your maximum bid is higher than the reserve, your initial bid will automatically be placed at the reserve. Why was my bid rounded down in the Confirmation Screen? When you place a bid it is required to be an exact multiple of the bid increment. For example, a bid of $10,000 is valid because it is an exact multiple of $50. A bid of $10,025 is invalid because it is not an exact multiple of $50. In this case the PicklesONLINE system will round your bid amount down to the nearest bid increment, i.e. $10,000. Bids will never be rounded upwards. Where can I see the PicklesONLINE terms and conditions? The PicklesONLINE terms and conditions can be viewed here. The first time you participate in each PicklesONLINE auction you will be asked to register your buyer details. This registration includes a link to the PicklesONLINE Terms and Conditions (Permanent Buyers skip this step). What is the difference between the sale end time and the lot end time? Every PicklesONLINE sale has a scheduled end time. All lots within the sale are scheduled to end at the sale’s end time. However, if there is any late bidding activity against a lot then we will extend the end time for that lot. Therefore individual lots within a sale may end later than the sale’s end time – and at different times than each other. Extending a lot's end time provides all buyers with the opportunity to respond to late bidding activity. What shipping options are available for PicklesONLINE? In most cases buyers collect PicklesONLINE items directly from the branch which is running the Pickles Online sale. Cartage (delivery) may be available for some PicklesONLINE items. To enquire about cartage simply contact the branch in question. Branch contact details are available on the Auction Details page for any item. Additional charges apply. Why can the lot end time change before an auction ends? If there is any bidding activity against a lot during the last 10 minutes of the auction, then we will extend the end time for that lot. This provides all buyers with the opportunity to respond to late bidding activity. The new end time for that lot is calculated as the time of the bidding activity, plus 10 minutes. For example, if a lot is scheduled to end at 8.30pm and a buyer attempts to place a bid at 8.27pm then the lot’s new end time will be 8.37pm. If there is any other bid attempt during the last 10 minutes then the lot’s end time will extend again. For example, if there is another bid attempt at 8.30pm then the lot’s new end time will be 8.40pm. If a lot’s end time is extended then the auction will end for that lot once there has been a period of 10 continuous minutes without any bidding activity. How do I know if I've won an item? It is possible to be the highest bidder on a PicklesONLINE item, but still not win the auction. This is because the vendor that owns the item may set a reserve price. If bidding reaches the vendor’s reserve then the item will be sold. However if bidding does not reach the vendor’s reserve then the item will not be sold. If you are the highest bidder on an item and the current bid meets the vendor’s reserve, then you will win the item. We will send you an email with a statement attached but you can always find out the status of all items you are bidding on by signing in to My Pickles. To find out if you have won a PicklesONLINE auction after bidding has ended, sign in to My Pickles and click on “Pickles Online" in the Bidding menu. All items for which bidding has ended will appear in the "My Closed Bids" section. The outcome of your bid is shown alongside the item. Apart from having the highest bid which meets reserve at the end of the auction, you can win an item outright by electing to “Buy Now". As soon as anyone elects to buy an item outright using Buy Now, it is withdrawn from bidding and the Buy Now purchaser wins the item. Items you have bought using Buy Now appear in the My Buy Now History section in My Pickles. Why didn't I win the item when I had the highest bid? In order to win a PicklesONLINE item, you need to be the highest bidder and your bid must meet the vendor’s reserve price. If bidding does not meet the vendor’s reserve then the item remains unsold at the end of the auction. In addition, some items may be purchased outright via the PicklesONLINE “Buy Now" service. An item being offered via Buy Now will always show a Buy Now price. If any buyer accepts that price and pays their deposit online, then the auction ends immediately and that buyer wins the item. Normal charges apply. What does registration status mean? The registration status is the status of the vehicle's registration at the time of inspection. Please Note: Registration status is true and correct at the time of Pickles inspection. Please refer to condition report for status update. No, it’s just that PicklesONLINE lets you input your maximum bid upfront. The system will then bid on your behalf up to this amount. For example, let’s say an asset you’re bidding on is priced at $100. Your maximum bid is $500. Put $500 in the box next to “Bid Now” and then press the button. The system will bid for you in $10 increments up to $500. If someone else joins the auction and bids $200, PicklesONLINE will automatically bid $210 for you so you’re always in the lead. If there’s a reserve on the item and your maximum bid is higher, the bid will go straight to the reserve. e.g. if the reserve on the lot in the example, is $450, the bid would go straight to $450. E-Salvage is an online bidding system that has been built in-house by Pickles Auctions specifically for the sale of Salvage vehicles located Australia wide. You no longer require a holding deposit to bid in the E-Salvage sales. You will now need to register individually for each E-Salvage sale you wish to participate in. If your bid is successful a deposit will be deducted from your credit card. If you have previously left a holding deposit with us, it is in the process of being returned to the credit card you previously provided and you will receive an email confirming the return of the funds. If your deposit was left more than 12 months ago we are unable to return the money to your credit card and will contact you to arrange a different method. Please contact depositrefund@pickles.com.au if you have any questions about your deposit. To assist us in identifying you please quote your bidding number, registered name, driver’s licence number and the first 6 and the last 3 digits of the credit card number you registered with. When a credit or debit card is added to a My Pickles account the card details are validated by the bank charging the card with a $1 pre-authorisation. This amount never eventuates into an actual charge on the cardholder's account - it will disappear within 5-7 days. Any time the credit card details are changed or updated on the My Pickles account this pre-authorisation will occur again. Is E-Salvage the same as Pickles Live auctions? No. Pickles Live is our live auction where you can participate in real-time over the internet for the duration of that auction. Pickles Live auctions only last a couple of hours for each auction. In comparison, E-Salvage is a static auction that runs over seven days where you can bid online at any time during the seven-day auction period. Is there restricted access to E-Salvage? No, members of the public and the trade alike can bid freely on Pickles E-Salvage. Bidding is simple and hassle-free. Each lot offered on E-Salvage will be there for a period of seven days where a bid can be placed 24-hours a day. All that is required is to select the vehicle that you want to bid on and then follow the simple steps of inputting the desired dollar amount. This will be confirmed along with the other applicable charges, giving the potential buyer a sum total of what the salvage/s will cost should the bid/s be successful. Is E-Salvage updated regularly with new stock? Yes. E-Salvage will be updated on an almost daily basis depending on the releases we receive from our insurance company clients. Once we have received a release for sale of a remotely located vehicle, it will be placed on to the E-Salvage site for bidding to commence. Can I place stock on E-Salvage for sale? No. E-Salvage is for the sale of genuine insurance stock only. How will I be notified if I am successful in a bid? Once successful, the buyer will receive an email confirming the purchase including all applicable charges. A deposit will be required for each lot purchased (the amount will depend on the purchase price of the lot). The locations and contact details for where the vehicle is stored will also be included. Please note that the responsibility for transportation of purchased vehicles rests with the buyer and vehicles will not be released until full payment has been received under the terms and conditions of the auction. Payment can be made via direct deposit, cash or bank cheque. Company cheques may only be used by current Pickles Permanent Buyers. Am I responsible for organising transport? Yes. Successful bidders on E-Salvage will be notified by Pickles. However, the responsibility of transporting the vehicle/s then lies with the purchaser. As stated above, please note that vehicles will not be released until full payment has been received. Yes. GST is included in the purchase price as it is also included in the fees associated with a successful purchase. The GST component will be broken down for the successful purchaser in full on the tax invoice provided. Is clear title of the salvages guaranteed? Clear title is guaranteed on all vehicles placed on E-Salvage. All vehicles are sold unencumbered and are flagged on WOVR (written off vehicle register). What is a bid increment & how is it calculated? Each bid placed in an E-Salvage auction must exceed an item’s current bid by the “Bid Increment". The bid increment amount depends on the item’s current bid. For example, if the current bid on an item is $10 then the bid increment is $1 and the next bid must be at least $11 ($10 + $1). If the current bid on an item is $50 then the bid increment is $20 and the next bid must be at least $70 ($50 + $20). If the current bid is $1,750 then the bid increment is $50 and the next bid must be at least $1,800 ($1,750 + $50). If the current bid is $8,800 then the bid increment is $100 and the next bid must be at least $8,900 ($8,800 + $100). If the current bid is $12,500 then the bid increment is $200 and the next bid must be at least $12,700 ($12,500 + $200). The current bid holder can adjust their maximum bid at any time, as long as their new maximum is at least equal to the current bid. For example, a bid of $10,000 is valid because it is an exact multiple of $200. A bid of $10,100 is invalid because it is not an exact multiple of $200. In this case the Pickles Online system will round your bid amount down to the nearest bid increment, i.e. $10,000. Does Pickles Auctions hold a Credit licence? Yes. Pickles Auctions holds a credit licence - number 388884 - and is also a member of the Credit Ombudsman Service - membership number M0005303. Can I finance my vehicle purchase at Pickles? Yes. 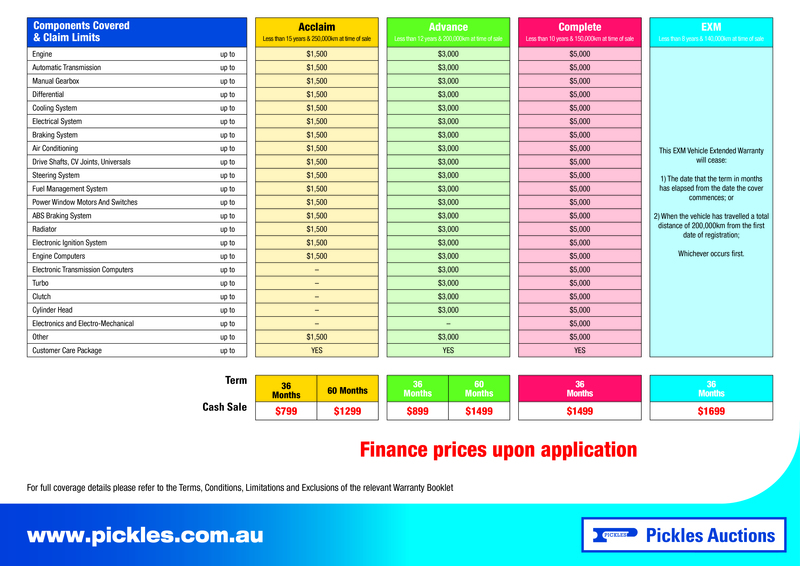 Pickles Finance is now available from all of our sites around Australia. At Pickles, not only can we arrange your car loan for you, but we also help you with competitive insurance and a warranty for your vehicle. Are the rates at Pickles Finance competitive? Yes. Pickles Finance has negotiated special rate plans with major banks and finance companies for Pickles customers. This allows us to deliver bank rate finance or better. Simply fill in our car finance enquiry or truck finance enquiry form. It's simple and only takes a few minutes to complete! Alternatively, if you don't like filling out forms, contact or visit one of our on-site offices. Our offices are conveniently located near the main entry to the auction room and are open everyday, including the day of the auction and vehicle inspection days. Does it matter who my vehicle may be financed with? No. Providing you can supply Pickles with an invoice or payout advice from your financier which includes their bank details and the GST inclusive purchase price, Pickles can make direct payment to them for the value of your Residual Value on your behalf. Can I organise my finance before I buy? Yes. Pickles Finance can pre-approve your loan for the amount you wish to borrow. This increases your confidence to bid at auction because you have the buying power. Can I finance my insurance? Yes. Pickles Finance can include the additional cost of insurance in your contract so you don't have to pay cash. A Pickles Finance representative can talk to you about the various options currently available in the marketplace and help you make your decision about the right type of insurance for your car and loan. We can assist with comprehensive insurance, vehicle warranties, and loan payment protection, among other products. Can I bid with confidence using Pickles Finance? Yes. Once approved by Pickles Finance, you will be issued with a Pre-approval Certificate which is for a specific value and valid for 60 days. Approval at Pickles Finance is fast. Once you've decided to purchase your car at Pickles, why wait longer than necessary for a bank to tell you whether they'll lend you the money? That's why at Pickles Finance you get an approval within the same day, sometimes within an hour! By using Pickles Finance, once you've signed the necessary paperwork, you can drive away in your new car. There's no need to organise a bank cheque because Pickles Finance will issue you with a Release Form that entitles you to automatically pick up your vehicle.